Many Android users are facing problems while installing or running Apps on their device due to insufficient RAM and Poor Performance.Whenever we open an App that needs more physical memory than available in our phone, device suddenly gets hanging and won’t respond.This is mainly due to lack of RAM(Random Access Memory) in our Android Device.In such situations, we can easily increase our Android Device’s RAM by doing a simple tweak. If your Device’s Android version is an outdated one like, Ginger Bread, Cup Cake Donut, etc. your device will be more likely to get crashed when opening Apps that require more physical memory.So, you cannot open any Games or Apps that need high Graphics. That’s exactly where this trick comes in handy. Whenever you try to open any Games or Apps, your phone suddenly get hanging, lagging, or even get turned off.It happens all because of insufficient RAM in your Device.We can fix this issue if we manage to increase our Device’s RAM aka Physical Memory.There are many apps for both rooted and non – rooted device doing this task. Today we are using one such App. No More Lag! No mire Hang only seemless superfast and efficient Samrtphone. Let’s say that you have an Android Device that is really old.Maybe your device’s RAM is somewhere around 256MB to 1GB. We will be using SD Card/Memory Card for this purpose, so make sure that you have a Memory Card which is of class 4 at least.Class 6 is recommended and Class 10 is great. Whether your Android device is rooted or not, I will share two unique tricks that will help you to increase your Device’s RAM and get outstanding performance on your device. Now with that all being set, let’s quickly jump into the tutorial and see How you can do it all yourself. If you are following Method 1, then your device must be rooted. If your device is not rooted then follow Method 2. Check if your device supports, memory swapping – Just install Memory Info and Swapfile Check and check whether your device is compatible. Memory Card which is at least class 4 and class 6 – 10 recommended. So, this is our basic requirements. 3. Now just click on “Swap Activ” and select your Memory card from the storage list(In most case it will be something like sdcard0). After selecting memory card click on Activ Swap button again. 4. Now follow the On-Screen Instructions and choose at least 512MB swapping memory.This process will take some time, depending on your device configuration. 5. After creating Swap File click on the Activ Swap button and you are done! 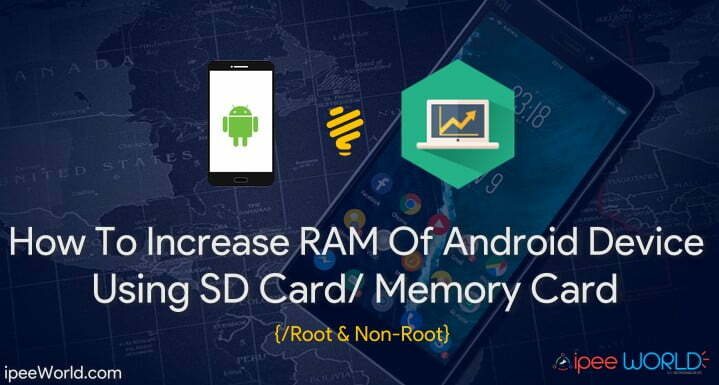 Smart RAM Booster is simple light weight Android App designed to Increase RAM of any Android Smartphone with a single click.This one is a very simple to use App which does not require any kind of Root Access. 2. Once Installed, Open the App. 3. Now you can Whitelist specific apps for increased performance. 4. Or, If you want to Boost your device’s whole memory, just click the “Boost Now” Button. Now your Android Device will be boosted for higher performance by killing unwanted apps.This app comes really handy when you want to increase your Android Device’s RAM without having Root Access in your Device. That’s it, guys, see how simple it was to Increase RAM of any Android Device. If your device has insufficient RAM for running any particular app, then you can actually make use of this tweak and run any app on your device.This tutorial will also help to fix your Android Device’s Poor Performance. Hope you guys found this Article, Do share this with your friends on favorite Social Media.Do comment down below if you face any problem anywhere in the Article. Super Lite reader is the name of the app and the developer is Super App Studio…this is the name I want for Smart Ram Booster App !! Please help me by mail given below as I have really started to read your site everyday !! thanks I love the way you explain …!! !